Contractor - Foster-Wheeler Environmental Corp. The U.S. Department of Energy uses the Savannah River Site in Aiken, SC for disposal of low-level radioactive waste. The waste is buried in trenches approximately 25 feet deep. Uncontaminated soil fill was used in the upper six feet of the trenches as a buffer between the contaminated waste and the site workers. Prior to close-out of the trenches and placement of a liner system, dynamic compaction was used to compact the waste material. Due to the nature of the radioactive waste, a detailed safety protocol was used. Radioactive testing was continuously performed to prevent exposure of on-site personnel. If wind velocities greater than 15 mph were recorded, compaction operations ceased for the day. 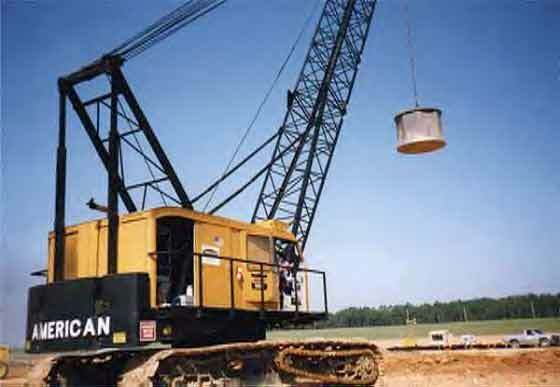 TerraSystems utilized a 20 ton weight eight feet in diameter to perform the dynamic compaction. The project lasted for over a year. Following completion of the dynamic compaction program, Foster-Wheeler Environmental Corporation placed a synthetic liner over the landfill.